A pair of Vintage Retro Industrial Factory Workshop Lockers probably from the 1960’s / 70’s, with working locks and keys. They have been well used, the paint is scratched and scraped with a few dents here and there - please study the photos carefully. The “Bugatti” one is in better condition than the “Lotus” one. These could be up-cycled nicely by fitting legs to them to make a great pair of retro cupboards. The measurements are: W = 46cm x H = 46cm x D = 47.5cm The signs have been riveted on. Because of the size they are collection only from north west London area, (HA5 postcode). Please ask any questions. Has wear to the feet so screw heads are exposed (plastic cover is wearing away). Would benefit from a clean and wax. Door closes well and is held closed by a little sprung ball, but has lost the lock. Vintage / Industrial Steel Filing Cabinet Nicely Patinated. Collection in person only. This was in my Grandfather's office for at least 30 years. 3 draw. Includes card folders and key. A lovely old set of small draws, suitable for collectors and curiosity. 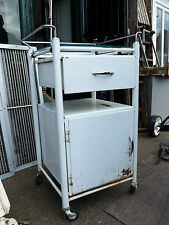 THIS IS A VERY HEAVY, STURDY, WELL MADE STEEL CABINET. 91 X 81 X 46 CMS (APPROX). New listingIDUSTRIAL VINTAGE STRIPPED STEEL SCHOOL LOCKER CABINET LOCKS WITH KEYS. IDUSTRIAL VINTAGE STRIPPED STEEL SCHOOL LOCKER CABINET LOCKS WITH KEYS.. 71.5 "HIGH. 18" WIDE. 18" DEEP. PLEASE CONTACT REGARDING COLLECTION. Vintage industrial chic painted steel cabinet. Heavy duty cabinet, possibly MOD, originally dark green but overpainted with paint peeling. Veteran Series Steel Green Index Card Filing Cabinet Vintage Series - 5 Cabinets. All in working condition. Some rust on all cabinets which can easily be painted over. Dispatched with Royal Mail 2nd Class or buyer to collect. Any questions please ask. THIS IS A VERY HEAVY, STURDY, WELL MADE STEEL CABINET. 92 X 82 X 46 CMS (APPROX). In original colour it has 9 small upper drawers above 3 larger drawers. All drawers fit and run smoothly. Has a label on the back - 'Cleveland Series - Doncaster' Lovely rocket legs. Depth - 41cm. Width - 28cm. Great as a display/storage cabinet for kitchen, bathroom or a living room. Locked with a working key. 3 glass shelves. Width 95 cm. Vintage Industrial reclaimed Metal / Steel Cabinet /safe with Shelves & Doors. Originally used in a bank as safety deposit cabinet since the 50's/60's recently removed. 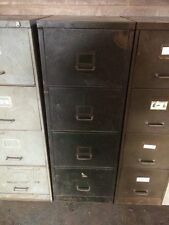 Made by Sheer Pride in the 40's or 50's this filing cabinet has a great utilitarian look to it. The paint is the original green with black to the wedge shaped legs and base. It weighs 25kg. Rust and Rot ~ Purveyors of wonderful things. There are three shelve positions but only one surviving 8mm shelf. They look good and like they've always been there. The cabinet can be used as a table top piece or can be hung to a wall via three pre-drilled holes (handy in the bathroom). The cabinet has been stripped, polished and lacquered. The cabinet is very well made and the drawers run smoothly. There is no key for the lock. The cabinet can be viewed/collected from Unit 2 Warehouse. There are 3 of them someone sprayed silver on them but they are vintage metal shelving they look good. Pick up from our new showroom in se15. There is free parking outside. Very close to Queens rd Peckham station. Free parking outside. It’s a perfect size for ones bathroom or indeed ones collectables. There are two original keys included, and for reference, one can move the shelves up and down to a desired height. It’s weighty, durable and can even be hung with the two pre-drilled holes on the reverse of the cabinet. 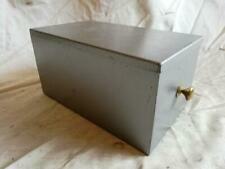 Vintage Industrial Black Painted Steel Gym Locker Storage Gun Cabinet. Key not included , easily cut . Great wear in black finish. Would make a fantastic gun Cabinet with a few minor adjustments or great as a man cave piece. Storage shelf to the top, central divider with full length hanging space to the left with rail, to the right three further shelves and recess to the base. H- 178cm D-46cm Width-46cm Internal Depth 43cm Collection GL9 area or courier can be arranged. Single shelf interior under side by side drawers. Missing one handle off one door, though not the twisting locking handle. I believe in ensuring quality furniture remains in circulation so it can continue to be cared for and enjoyed. LOCATED AT EH558EJ & COLLECTION ONLY DUE TO SIZE & WEIGHT. THE CABINET HAS GLAZED SIDE AND DOOR PANELS. CABINET IS FINISHED IN RUSTIC WHITE. CABINET HAS MARKS, KNOCKS, SCUFFS AND WEAR / TEAR ASSOCIATED WITH AGE AND USE - IF YOU EXPECT A LIKE NEW ITEM THEN THIS IS NOT FOR YOU. The mining lockers have a trendy green paint colour, which would suit any retro style space. We have only pictured one locker here – for illustrative purposes – and the item you receive may vary slightly in appearance. These small signs of wear are normal and appropriate to their authenticity. Obviously, we will help where we can. This doesn't detract from it, we don't think, and is, in fact, what gives these lockers their character. All steel construction, quality item. Steel cabinet with 8 drawers and shoot bolt locking on a rotating countersunk handle. This is in tatty, but solid condition, the drawers run in and out smoothly. It is 645mm tall, 380mm wide and 625mm deep. It would look good in a a bar or retro look home. Collection would be best on this, or I can deliver locally for 50p/mile. I'm in Stamford, near Peterborough PE9. All steel construction, quality item. i love the fact it’s got paint splattered on it looks amazing! The worn, layered paint, old repairs & even amount of wear combine to make this a wonderful decorative piece of furniture with bags of character which is still also very usable. Sorry collection in person is not possible. I have painted this light Blue throughout to freshen it up. All steel construction with, quality item. Width 19.5”. The cabinet would have housed files and is well made and weighty. It is presented in a classic mid grey - very much the right colour for the era. The cabinet does have the usual wear and tear marks for an item of this age - no big dings or dents with slight wear to the drawer edges and wear to the bottom edges which is to be expected, and we would say adds to its appeal… The drawers which are split internally into two are running well and closing as they should. Here I have for sale a great Looking industrial bank of drawers 🏭 🏭. Super cool rustic look to it. Has been burnished to reveal the raw steel with cool patches of rust coming through looks the part! Here I have for sale a great Looking industrial cabinet. Super cool rustic look to it. All steel construction with, quality item. has shelf’s inside, great piece! Fabulous industrial cabinet with ten drawers, not sure what it would have been used for, I wonder if perhaps it might have been for ammunition? Very strong and secure with lockable strong backs new lock and two keys, and on heavy castors with brakes. Overall cabinet measures 32" tall, 21" wide and 15" deep. Each drawer is 71/2" x 4" x 141/2 " deep. Battleship grey with cosmetic wear and tear, a proper dealer would call it patina, I always thought that was a kind of rice. Thanks for looking collect from SN153JU, 10 mins from M4 jnc. 17. Happy to wrap if you want to arrange a courier your end.....it's heavy! It has a sliding door going inside on the right side. Industrial Furniture! Collection in SE3 7DF. These small signs of wear are normal and appropriate to their authenticity. Obviously, we will help where we can. Sold with working locks and keys. Height: 182.5cm. The top can be stripped further to hide rust marks if need be. 1959 Sankey-sheldon cabinet. great size for a tv unit. One man’s junk. i will not be held responsible for it in any way once it has left been collected by your currier.